The European Commission has not taken an official position on the independence referendum in Catalonia. But now some European lawmakers are calling for it to mediate. 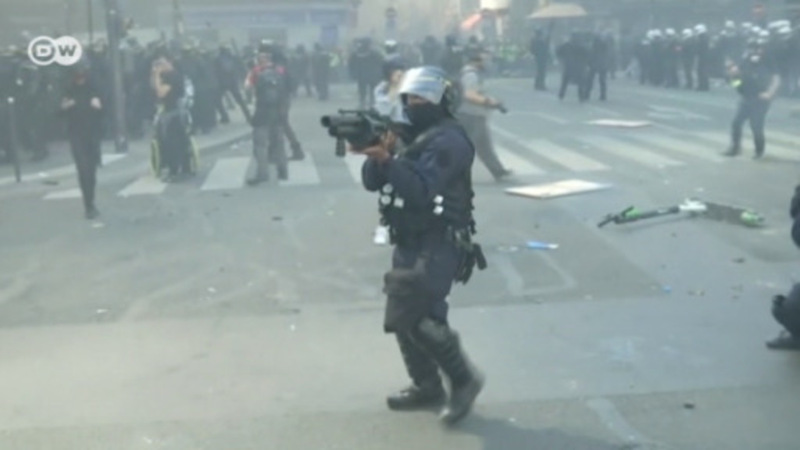 DW's Bernd Riegert reports from Brussels. Some Catalan politicians – though not the Catalan government – have joined with the Green group in the European Parliament to call on the European Commission in Brussels to mediate between Madrid and Barcelona. The EU itself is not taking sides in the region's independence dispute. "For the European Commission … this is an internal matter for Spain that has to be dealt with in line with the constitutional order of Spain," said Commission spokesman Margaritis Schinas, echoing numerous earlier statements from the bloc. But along with this legalistic formulation, Schinas warned, "violence can never be an instrument in politics." "We trust the leadership of Prime Minister Mariano Rajoy to manage this difficult process," he said, adding that Sunday's referendum was "not legal." Seeing the rule of law in Spain under threat, the Greens in the European Parliament are urging the responsible EU commissioner, Frans Timmermans, to mediate between the central government and the Catalan independence movement. But the EU can hardly intercede against the will of Spain, a member state whose Supreme Court has declared the referendum illegal. EU diplomats in Brussels say an intermediary would have to be invited by both sides. And as a point of law, the structure of each member state is a matter for it alone. As far as the EU is concerned, the independence referendum in Scotland two years ago took place under completely different circumstances, as the central government in London had agreed to the vote. Before the referendum in Catalonia, the European Commission once again made it clear that an independent state of Catalonia would no longer be part of the EU and would have to apply for admission to the bloc. The same procedure would have applied to Scotland had the Scots voted in favor of independence. Jo Leinen, a European parliamentarian from Germany's Social Democratic Party, called on both sides – Spanish Prime Minister Rajoy and Catalan Prime Minister Carles Puigdemont – "to return to the negotiating table after the chaotic plebiscite as quickly as possible." Leinen, a member of the parliament's Constitutional Committee, said in Brussels, "political crises in an EU member state always have a European dimension and affect all of us." He stressed the European Commission should offer its assistance and act as an impartial mediator. The two major groups in the European Parliament, the Conservatives and the Socialists, have so far opposed putting the issue of Catalonia on the agenda. In both groups, Spanish lawmakers rejected a request to that effect from the smaller Green group. The head of the Liberal group in the European Parliament, Guy Verhofstadt, said he did not want to interfere in Spain's internal affairs, but condemned the use of violence on both sides as "absolutely unacceptable." De-escalation, he said, was urgent: "The only thing that can help us is a political solution that respects the constitution and the rule of law, in which all parties in the Catalan parliament are involved – including the opposition." If the Catalan government were to proclaim itself an independent state, based on its declaration that the referendum was valid, it would be highly unlikely that any EU state would recognize this independence. Such a direct attack on EU member state Spain would lead to a crisis within the bloc. That is why many EU diplomats in Brussels cannot imagine this scenario. The Catalan government already organized a referendum on self-determination in 2014. Then, too, its request for support from other states in the EU went unheard. And the Spanish central government, led by conservative Prime Minister Rajoy, again declared that the unity of Spain was irrevocable.